No 11 Pilton Street is currently the home of Masala, an Indian Takeaway established in the mid 2000s. 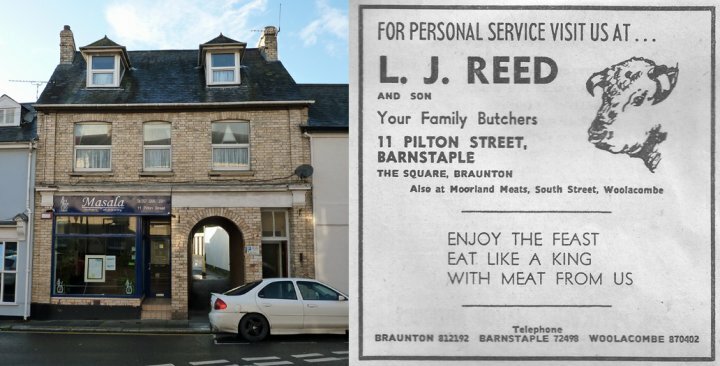 This shop was a butcher, L J Reed and Son, in July 1982 at the time of the first Pilton Festival. The advertisement above is taken from the report of the first Pilton Festival in the North Devon Journal Herald on 22nd July 1982. LJ Reed & Son still have a shop in Braunton. In 1984 the butchers shop was owned by R D & C Clarke. From Kelly's Directory in 1941 we also learned that No 11 was a Grocer and Fruiterer run by Mrs Maude Gist. If you have anymore information about the history of the shop and No 11, please let us know. Thanks to Albert Linacre for a copy of the ND Journal Herald.